Haringey Borough Commander, Victor Olisa, has backed the local Liberal Democrat campaign for a 50% Council Tax discount for Special Constables. The Commander, who confirmed his support during a meeting with Liberal Democrat MP Lynne Featherstone, joins the hundreds of residents who have already signed up to show their support. The proposal would see every Special Constable in Haringey receive a 50% Council Tax discount. Campaigners say this will reward existing Special Constables, as well as encouraging other local residents to volunteer and help the police fight crime. Labour-run Haringey Council will make the decision on whether to adopt the proposal at a Council meeting on the 26th February. “It is great to secure the support of the Borough Commander on this campaign to reward and encourage our hardworking special constables. Lynne Featherstone MP and the Haringey Liberal Democrats have today launched a campaign to give local special constables a 50% discount on their Council Tax. The campaigners say this will reward existing special constables, as well as encouraging other local residents to volunteer and help the police fight crime. The Haringey Liberal Democrats are looking to collect as many signatures as possible to support the campaign – which has been successfully implemented in other Council’s in the UK. Haringey Council will make a decision on whether to adopt the Liberal Democrat’s proposal later in the month. “Our campaign to give Special Constables a 50% reduction in Council Tax will increase the number of these volunteers across the borough. This will give the local police extra help, and make residents feel safer, too. “When I’m out on the doorsteps, residents regularly speak to me about crime, or fear of crime. It’s an issue that affects all of us at some point in life. “So, it’s vital that we give reward and incentivise Special Constables, who give up their own time to fight crime for free. And under our proposal – volunteering to fight crime really would pay off! Lynne Featherstone MP has today requested a meeting with Haringey Borough Commander Victor Olisa, following recent news about burglary figures in N10 and N2. The figures, based on the number of people who have made insurance claims for burglary, place N10 and N2 in the top twenty burglary hotspots by postcode in the UK. The Liberal Democrat MP and the Haringey Lib Dems have also renewed their call for a replacement Safer Neighbourhood Team base and Police Front Counter in the N10 area. Muswell Hill police station and front counter was closed earlier this year, as part of the Conservative Mayor of London’s changes to policing in the capital. The N10 and N2 postcodes encompass Muswell Hill, Fortis Green and Alexandra wards within the Hornsey and Wood Green constituency. “It’s very worrying to see our local area so high in this list of burglary hotspots. I have requested an urgent meeting with the Borough Commander to see what he thinks of these figures, and ask whether his crime statistics match up. “We are still waiting for a proper Police Contact Point in the Muswell Hill area following the closure of Muswell Hill police station. It’s vital that the public have easy access to our hard working and vigilant Safer Neighbourhood Team, if they need to report a crime or raise concerns. Save Muswell Hill Front Counter! Policing in Haringey is undergoing major changes. This all started last year, when the Conservative Mayor of London announced that changes would be made to policing in Haringey and across the city. In the current economic climate, changes have to be made to make policing more efficient and cost effective. But from day one, the Lib Dems were clear that any changes should not have a negative impact on public access to the police. Police front counters, for instance, are vital local services – allowing victims to go and report crimes face to face, in a safe and secure environment. We all hope that we will never have to visit one, but it is certainly reassuring to know they’re there. So, when the Mayor mentioned that front counters might be closed and replaced with contact points, we started expressing our concern and asking questions. Straight away, Lib Dem London Assembly member Caroline Pidgeon asked the Mayor for a guarantee that there would be no time gap between a front counter closing and new contact point opening. The Mayor gave this guarantee, and went on to say that no front counter would be lost without an ‘equivalent or indeed better’ replacement – open for the same number of hours. During the consultation period, the Haringey Lib Dems and I called on the Mayor to keep to his word. You can imagine our disappointment and anger when the Mayor announced his final plans, which include the closure of Muswell Hill volunteer counter. This would leave a huge chunk of the borough without proper access to front counter services. Yes – changes had to be made, but not like this. In response, I have launched a petition, calling on the Mayor to retain a local base for the Safer Neighbourhood Team on, or near, Muswell Hill Broadway with an accessible front counter for the public to report crimes. After launching the petition, I met with Haringey’s new Borough Commander – Victor Olisa. I was very pleased to hear that he had contacted the volunteers and is keen to keep a police presence in Muswell Hill. But Haringey Police need help finding a new location for the service – as the Met will be selling the building it currently operates from. So, Haringey Police are willing to keep the volunteer counter service, but only if a suitable location can be found. Please contact me if you have any ideas for a suitable location for a front counter service in or around Muswell Hill. We also saved this very front counter once before. With enough support from residents and Haringey Police, we can do the same again. 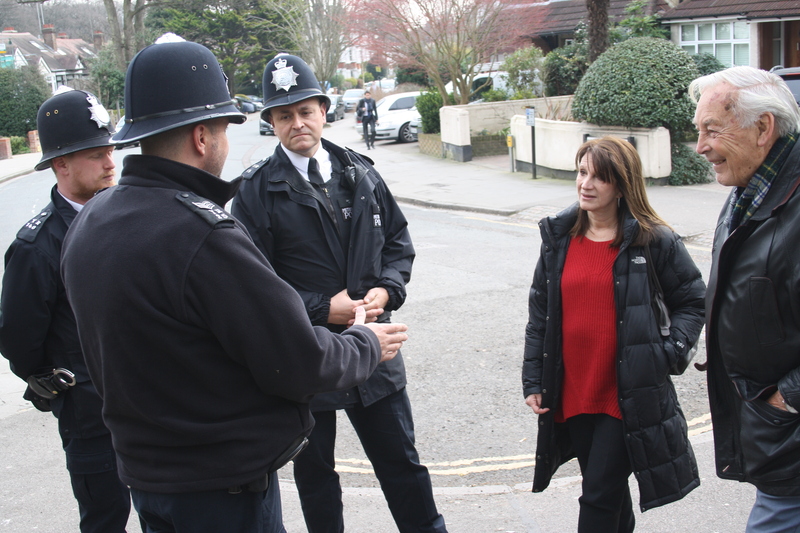 Lynne Featherstone MP has taken a step forward in her campaign to save Muswell Hill’s volunteer police front counter, following a meeting with Haringey’s new Borough Commander, Dr Victor Olisa. The Liberal Democrat MP launched a petition last week, calling on the Conservative Mayor of London and the Metropolitan Police to maintain a front counter service and police base in Muswell Hill. During the meeting, the Borough Commander said he had spoken to the 70 volunteers who staff the front counter. He affirmed his commitment to keeping the volunteers and a contact point, despite the Mayor’s decision to sell the building that the counter currently operates in. The Borough Commander further confirmed that Haringey Police are looking for a suitable replacement premises in Muswell Hill. In the mean time, the volunteers will operate from the safer neighbourhood team base in East Finchley. “It was fantastic to see the Borough Commander’s enthusiasm for keeping a police contact point staffed by volunteers in Muswell Hill. “This is a vital local service and it would be such a shame to lose it. Residents should always have access to a local and safe place, where they can report crimes face to face.